All speech-language pathologists are now aware of the term “evidence-based practice” (EBP) and the pressure to become evidence-based practitioners. However, most of us have zero ideas on how to actually use what the evidence suggests within our clinical setting. I do not know what the current university courses are telling graduate students, but since I graduated in 2000, I have had no instruction in this area. I have felt clueless and behind the times for years. Because no one actually defined EBP for me, I was left to assume that I should be doing whatever research articles out there suggested. However, the very few articles that I had free access to always ended with a “more research is needed” section. I left reading the dense and overwhelming journal article feeling defeated. I determined that could never be “good” clinician. A few weeks ago, however, I started my doctorate program and two of my three courses are “Evidence-Based Practice” and “Research Methods”. I have gone from never having used PubMed before, to narrowing down a topic from 6000 articles to 7 within a few minutes. I still have so much to learn, but have realized how much I was missing out! I have also learned that reading one research article does not mean I have found an evidence-based intervention. In fact, reading one journal article means that I have read exactly one journal article. I can use the article to think more creatively about my students and my therapy, but I cannot and should not use this research to change my practice. A few months ago, this would have meant that I would throw up my hands in despair. But now, thanks to my courses, I have learned about “systematic reviews”. A systematic review is a summary of multiple research articles that are focused around one clinical question (Guatt, Rennie, Meade, & Cook, 2015, p. 460). The reviews help the clinicians understand the accuracy of the research, efficacy, and summarize the evidence in a way that is usable for the readers (that would be you and I!). Single studies may not represent the majority of the evidence on the clinical question. Researching multiple studies is extremely time intensive. Systematic reviews will, if done well, provide evidence on treatment effect. Systematic reviews contain far more subjects than a single research study, therefore enabling more confidence in the results. How do I Find Systematic Reviews? I begin my search in PubMed by looking at the key terms “autism” and “augmentative communication”; PubMed yields 130 articles. This is not an unreasonable number of articles to look through if I have a few hours, but I notice right away that some of the articles have titles such as “Designing a chat-bot for non-verbal children on the autism spectrum”. I am sure that this is an extremely interesting article, but it will not help me in my clinical query. I customize the article type to “systematic reviews” and my number immediately drops to 20 results. One of these, “A systematic quality review of high-tech AAC interventions as evidence-based practice” looks like it might be exactly what I need. You have found what may help you to weigh the evidence and make a good evidence-based decision, but… you can’t get hold of the article. The problem remains that is it extremely difficult for the practicing clinician to get ahold of systematic studies. Unfortunately, I have no magic solution for you besides going back to graduate school and getting access to their research library. ASHA has a few (very few) Evidence-Based Systematic Reviews on this page. ASHA’s evidence maps page links to systematic reviews (the number of reviews linked to these maps is fairly impressive). When I went to the evidence map for AAC, the page pulled up 157 articles, many of which were systematic reviews. Unfortunately, many are not free to read. Google and google scholar is always an option. The search “aac autism systematic review” generated 5000 results. However, when I went to the advanced option (the three horizontal lines on the left of “Google Scholar”) and clicked on “in the title of the article”, it pulled up just 5 hits. To the right of one of these hits was a “pdf”, meaning that you can get free access to that pdf. Not great, but better than nothing. Last year, I began subscribing to “The Informed SLP” (TISLP) to get reviews of more journal articles that I otherwise could not access. If you are a subscriber, click on the topic that you are interested in learning more about. Then read down the list to see if any of the articles listed include the phrase “systematic review”. If so, click on that article and read what TISLP has to say! 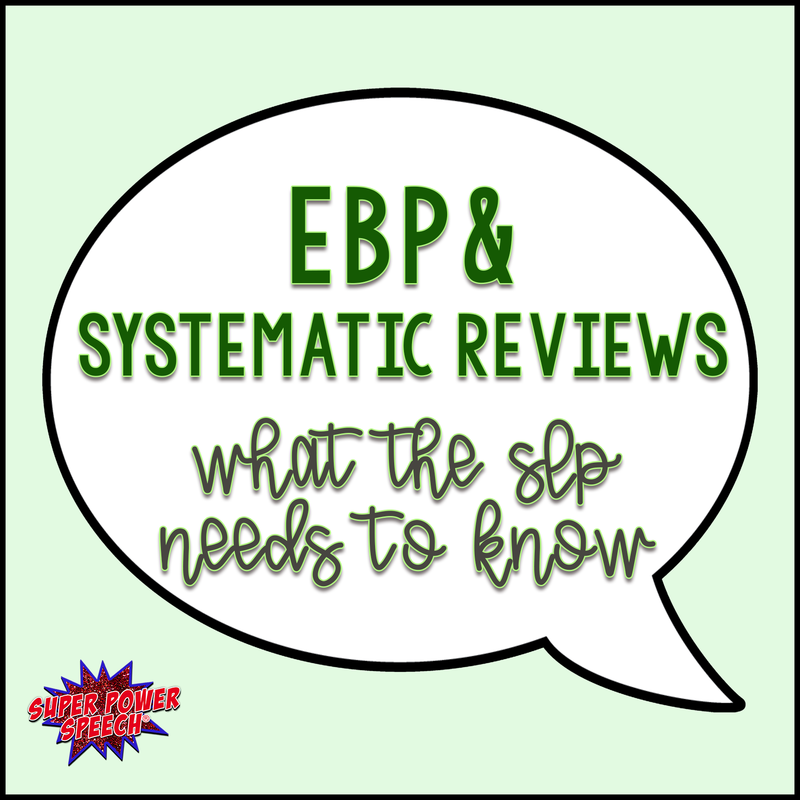 A final note, after you find the perfect systematic review and undoubtedly cannot access the full article, try the tips listed here by Dr. Meredith Poole from The Informed SLP. She has some great ideas that just might get you exactly what you are looking for! Best of luck to you, endeavoring EBP SLP! Guyatt, G, Rennie, D., Meade, M.O., Cook, D. J. (2015) Users’ Guides to the Medical Literature: a Manual for Evidence-Based Clinical Practice. New York, NY: McGraw Hill Medical.